Click any of the headings below to reveal more information. 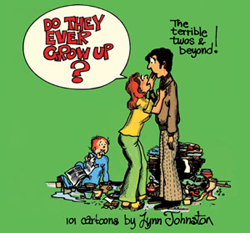 For a more detailed biography, see our 2015 book For Better or For Worse: The Comic Art of Lynn Johnston. I was born Lynn Ridgway in Collingwood, Ontario, Canada, and I grew up in British Columbia. My father was a jeweler, my mother a calligrapher and bookkeeper—both were musical, artistic and creative people. We were a family that loved to laugh. Image: a self-portait Lynn drew. Here, she's about six years old. My brother became a professional musician (trumpet) and I went to the Vancouver School of Art, hoping, somehow, to make a career as an artist. My main interest was animation, and after two years of Art College, I took a job in an animation studio in Vancouver where I worked in the ink and paint department and began to apprentice as an animator. Image: some student art from Lynn's time at Vancouver School of Art. I married a television cameraman and in 1969 moved to Ontario with my husband where work in the media was more available. Unable to work in animation in the city of Hamilton, I got a job as a medical artist at McMaster University. It was a wonderful five years of learning. I gained a reverence for life and the human body that only one in a hospital environment can achieve. Image: At McMaster, Lynn created many medical-themed illustrations, which professors used to help students remember important concepts. In 1972 I discovered that I was expecting Aaron, and left McMaster to work at home. 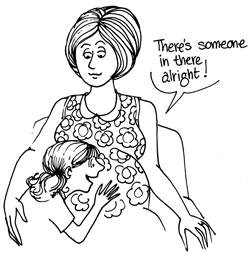 My obstetrician challenged me to do some drawings for the ceilings above his examining tables, and during my eight months of regular visits, I did over eighty comic drawings for him...my view of pregnancy. 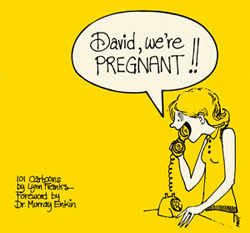 These were published in a book called "David, We're Pregnant" which sold over 300,000 copies. It's now out of print and a rare "find" in second hand book shops! 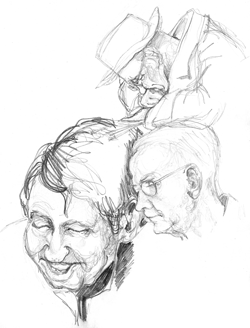 Images: Some of the art featured in Lynn's first book. Shortly after the publication of my first book, I was divorced and as a single parent, I worked as a commercial artist, free-lancing from a greenhouse I turned into a studio. These were "hard times" as they say—but a real education, as I did everything from pasting type to designing cereal boxes, billboards, leaflets, posters, flyers and book illustrations. I learned a great deal more about commercial art than I ever learned at art school. 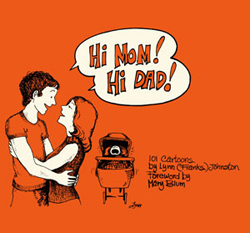 In 1975, "Hi Mom, Hi Dad" was published, a sequel to "David", and at this time I met and married Rod Johnston, then a dental student in his second year at the University of Toronto. I continued to freelance doing serious, comic and medical art from my studio until Kate was born and Rod had graduated from dental school. "Do They Ever Grow Up?" 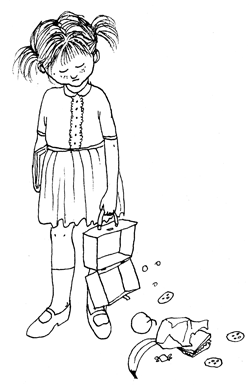 was the third publication in a sequence of books I began as a humorous but down to earth look at parenting. All three are out of print. I think "Hi Mom, Hi Dad" is the hardest to find. In 1978, Rod, Aaron, baby Katie, and I were planning to move to Lynn Lake, Manitoba. 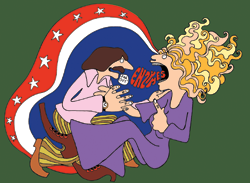 Around this time, editors at Universal Press Syndicate saw my books, wrote to me, and asked if I was interested in doing a daily comic strip. 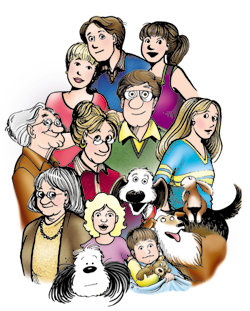 I sent off twenty examples of "The Johnstons"—a series based on our own family, since we were the only people I knew I could draw over and over again, with consistency. Expecting to be politely turned away, I received and ultimately signed a twenty-year contract—and the work began. In 1979, however, when it came time for actual publication, I decided to change the characters' names—to my family's second names (Aaron Michael, Katherine Elizabeth, Roderick John) except for Elly, who was named for a dear friend of mine who had passed away. My editor, Lee Salem, suggested the title "For Better or For Worse"—and it seems to have been a good choice, as the strip is not all roses. Most cartoonists start the way I did: doodling on anything as soon as they were able to hold a pen. I've always loved to draw, and have always had a silly streak that more often than not, got me into trouble. "For Better or For Worse" lets me put it to good use! 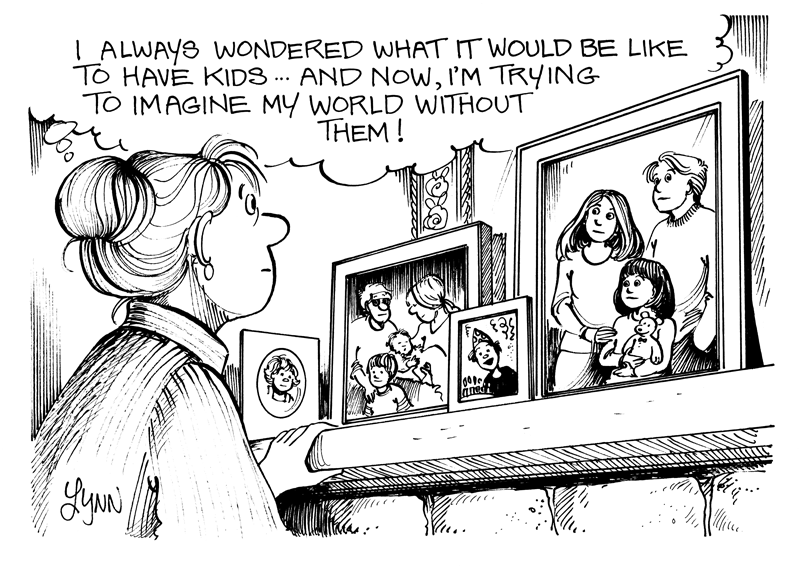 I always knew I would be a cartoonist, but I never expected to make my LIVING as one! 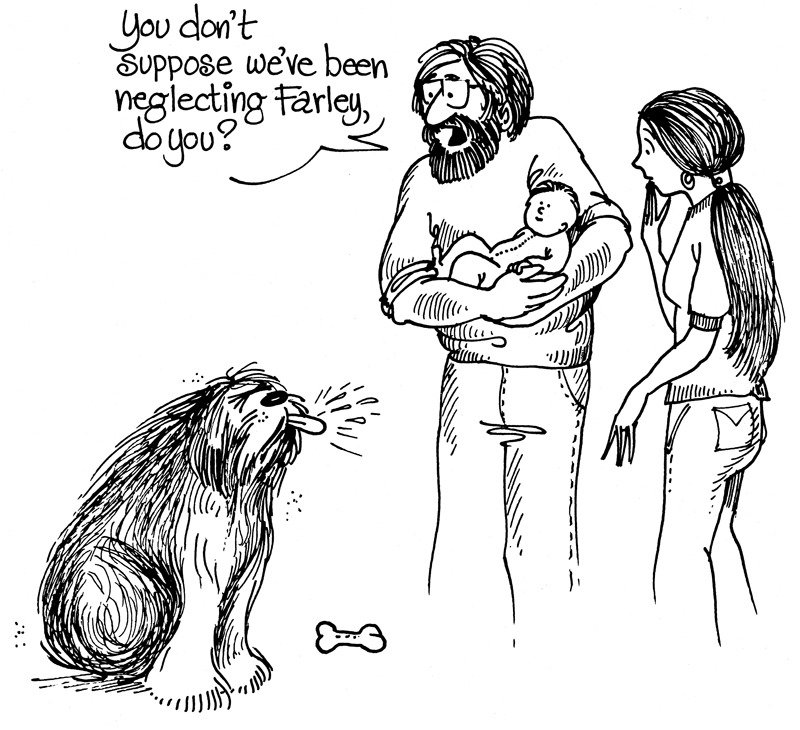 For Better or For Worse originally ran from 1979 until 2008, following Elly Patterson's life as she raised her family. "For Better or For Worse" now appears in over 1600 papers in Canada, the United States, and other countries. It has been translated into eight languages. There are more than 30 books currently in print. 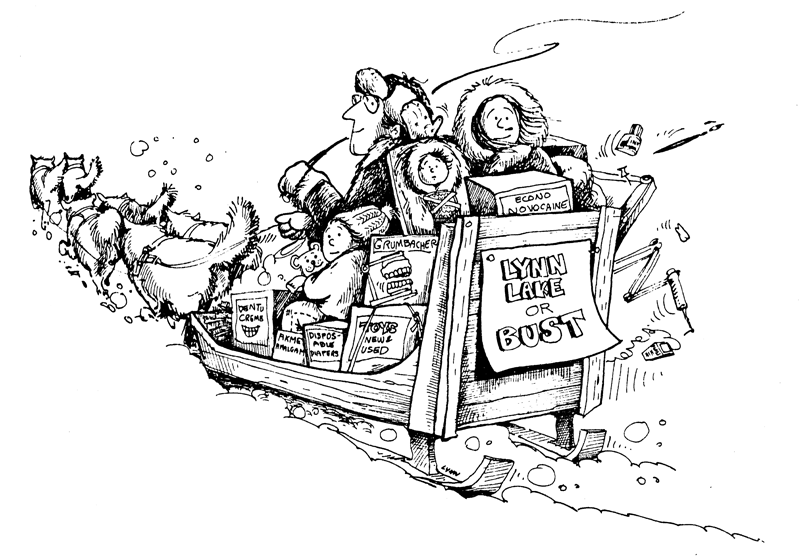 In 2008, Lynn retired from drawing new strips, and FBorFW began running again in the newspapers from the beginning. For more information, see "Growing Up All Over Again: FBorFW From 1979 to Now".